Posted February 23, 2016 (edited) · Building Cura (dev version) with MinGW-w64 works, but Cura fails on launch. After installing the freshly built installer package on a Windows 7 Virtual machine... I get an error. So not all is well yet... For the error see my latest entries in this thread below. 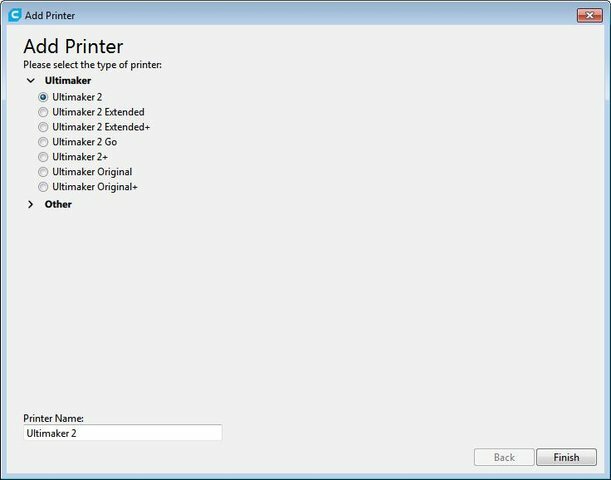 Although the Cura package and installer build to completion, launching the Cura (developer's version) program fails with the error at the end of this thread. After a few tweaks, the Daid script worked for my installation using the latests MinGW-w64+MSYS2 and the installer package builder NSIS3 except for the build of CuraEngine.exe, which must be compiled from scratch. But I already built it using the cura-build (developer's version) script. Just copying that one and using the rest of the Daid script seems to work. Cura installs and runs correctly as far as I can see. I still need to figure out why the dev version of Cura crashes after launch though. Why do you want to build it in the first place? The building is to create a distributable. I'll have a look into our build system in a bit to see what might cause this. I don't ever seem to get the protobuf-python state. Have you updated all repo's to 2.1? Posted February 23, 2016 · Building Cura (dev version) with MinGW-w64 works, but Cura fails on launch. I want to build it to educate myself and to possible mess around with the code later. What do you mean by 2.1? This should give me the master repository and therefore the latest Cura version? You also need to ensure that the preferences backend_location is set to the right place. Python is an interpreted language. There is no need to compile it. Posted February 24, 2016 (edited) · Building Cura (dev version) with MinGW-w64 works, but Cura fails on launch. So, I basically get the same error as I first reported in this thread. in Python? I thought it was written in C++ and therefore needs to be compiled. umagi@HOME-PC MINGW64 /G/dev/cura-b2.1/libArcus/build (2.1)$ cmake -G "MinGW Makefiles" ..-- Could NOT find PROTOBUF (missing:  PROTOBUF_LIBRARY PROTOBUF_INCLUDE_DIR)-- Found SIP version: 4.17CMake Error: The following variables are used in this project, but they are set to NOTFOUND.Please set them or make sure they are set and tested correctly in the CMake files:G:/dev/cura-b2.1/libArcus/PROTOBUF_INCLUDE_DIR  used as include directory in directory G:/dev/cura-b2.1/libArcusPROTOBUF_LIBRARY (ADVANCED)   linked by target "Arcus" in directory G:/dev/cura-b2.1/libArcus-- Configuring incomplete, errors occurred!See also "G:/dev/cura-b2.1/libArcus/build/CMakeFiles/CMakeOutput.log". Posted February 24, 2016 · Building Cura (dev version) with MinGW-w64 works, but Cura fails on launch. The cura engine does need to be built, but that is much much easier to build than building all the distributables for Cura. cmake -G "NMake Makefiles" -DPROTOBUF_INCLUDE_DIR="E:\DevTools\protobuf\include" -DPROTOBUF_LIBRARY="E:\DevTools\protobuf\lib\libprotobuf.lib" .. The actual error above was because protobuf was CMake-configured with DCMAKE_BUILD_TYPE=Release, so I needed to use it for libArcus too. cmake -G "NMake Makefiles" -DCMAKE_BUILD_TYPE=Release -DPROTOBUF_INCLUDE_DIR="E:\DevTools\protobuf\include" -DPROTOBUF_LIBRARY="E:\DevTools\protobuf\lib\libprotobuf.lib" .. So the libArcus part compiles and installs correctly now. was because I installed the 64bit version of python 3.4.4. Replacing it by the 32bit version eliminated that error. g:\dev\cura-b2.1\curaengine\src\utils/gettime.h(: fatal error C1083: Cannot open include file: 'sys/time.h': No such file or directoryNMAKE : fatal error U1077: 'E:\MICROS~1.0\VC\bin\amd64\cl.exe' : return code '0x2'Stop. I tried to compile it with MinGW instead, but then I get errors relating to the fact that I should probably also build the other dependencies (libArcus and protobuf) using MinGW instead of MSVC? OOPS.. this message was posted twice? We don't build anything with msvc as far as I'm aware. The building system we use is rather complex and fails quite often, so sorry for that. Posted February 25, 2016 (edited) · Building Cura (dev version) with MinGW-w64 works, but Cura fails on launch. I am at the stage where it starts to build the CuraEngine (I got the all the required dependencies to build, after some tweaks). For MinGW make to work correctly sh.exe must NOT be in your path. Run cmake from a shell that does not have sh.exe in your PATH. Some say that using MSYS Makefiles make things run slower, but I don't really care for the moment, as long as things get done. The build script does not currently recognize all  platforms supported by Qt. Rerun this script with a -platform option listed to  set the system/compiler combination you use. Performing the dry run mingw32-make install -n in the Sip directory above shows which files are to be copied where. I know, not very pretty at all, but since I don't know much about build systems like this one, and since it works, I don't really care for now. at the command line of g++. So the quotes are escaped correctly. I'm stuck with this error for the moment, so if anyone has an idea of what's going on, please let me know! Thanks! As a temporary workaround, we replaced the VERSION string by a litteral string, i.e. After this, CuraEngine proceeds to build to completion! The following error is for a MSVC build of Numpy, which is the default on my system. I leave the info below for reference, but this error does not apply to mingw32 builds of Numpy. Another error happens then, see below. In Windows 7, Right click on My Computer -> Properties -> Advanced system settings -> Advanced -> Environmental Variables. 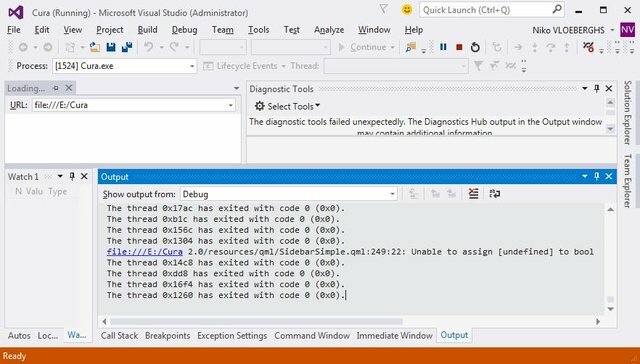 In the System Variables, there should be a Variable called VS100COMNTOOLS that points to the Visual Studio 2010 Tools Directory. The problem is that the numpy distutils is trying to read the symbol table using "objdump" from msvcr100.dll but it can't recognize the format. The errors are shown below as per the original posting. mkdir buildcd buildcmake -G "MSYS Makefiles" ..
EDIT: The following error occured when running the MSVC build of Scipy, which was the default. I needed to change it to a mingw32 build as shown further below this comment. The above clearly uses the VS2015 linker because the default Scipy build uses the default compiler on my system, VS2015. Again, don't forget to rerun CMake after this! These errors are due to a bug in Lapack v3.6.0 as mentioned above, and do not occur when using v3.5.0. Build v3.5.0 and copy the generated library files to the Python Libs directory as described above. Posted February 25, 2016 · Building Cura (dev version) with MinGW-w64 works, but Cura fails on launch. I just repeated the workaround described above for that error, and resumed the build. Posted February 26, 2016 · Building Cura (dev version) with MinGW-w64 works, but Cura fails on launch. I had to install the py2exe package. Finally, after installing the correct version of py2exe and resuming the build, the target builds to completion! Finally! Posted February 26, 2016 (edited) · Building Cura (dev version) with MinGW-w64 works, but Cura fails on launch. Finally, I called "mingw32-make package" to build the Cura installer. So it tries to find a package called arduino, which I don't seem to have (although Arduino 1.6.7 is installed on my system). We downloaded the vcredist_x86.exe (because we have a 32bit build) and copied it to the cura-build directory. Run CPack packaging tool...CPack: Create package using NSISCPack: Install projectsCPack: - Run preinstall target for: cura-buildCPack: - Install project: cura-buildCPack: -   Install component: arduinoCPack: -   Install component: curaCPack: -   Install component: vcredistCPack: Create packageCPack: - package: G:/dev/cura-build/build/Cura-2.0.99-2.1-win32.exe generated. Errors in 'Cura.exe'See logfile 'C:\Program Files (x86)\Cura 2.0\Cura.log' for details. Posted February 27, 2016 (edited) · Building Cura (dev version) with MinGW-w64 works, but Cura fails on launch. I started the build from scratch, using my newly gained experience from the above steps and deleted the cura-build/build directory. Note: It seems building under MSYS2 seems a little bit unstable? I got errors such as Too many open files, and another error relating to some truncated object file? Posted February 29, 2016 · Building Cura (dev version) with MinGW-w64 works, but Cura fails on launch. I don't really know what caused the crash you have now. How do I run the Cura python part from source in the cura-build build? 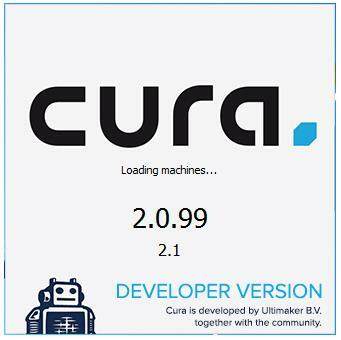 Is it done by launching cura_app.py from the cura-build\build\Cura-prefix\src\Cura directory? in order to start Cura. I run this from the Cura folder.